This was the first calculator I owned, we had to buy one when I was in grade 10. My older brother and sisters used a slide rule. This was $50 and I got a deal because the school ordered a lot at a time. 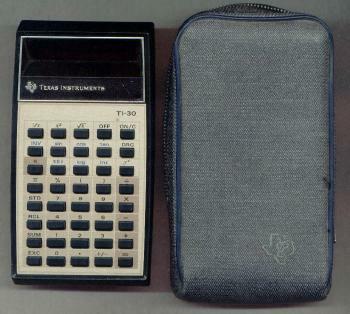 It was called a scientific calculator but really only did a few functions like sine and cosine. It had a red display and took a 9 volt battery. Times have changed! 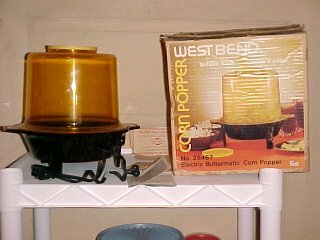 This was the best popcorn popper in the world! Much better than doing it in a pot, which we used to do, and way better than the air poppers which we got a few years after having this one. What made this popper so good was the top where you could place butter and it would melt as the popcorn was popping and drip down onto the popcorn. Then you placed a little cover over that spot, turned the plastic lid upside down and that became the bowl. When I was a teenager we popped popcorn every Friday evening and watched Dallas. 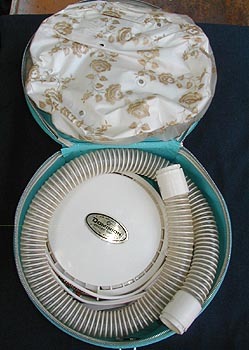 This was my older sister's but we were allowed to use it (she was so generous). I remember sitting on the living room floor with the plastic cap over my head drying my hair. If we were in a hurry we'd just use the hose without the cap. 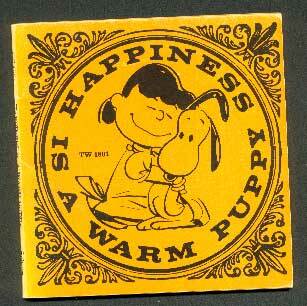 I suppose everyone had a viewmaster, there were a couple in our home growing up. 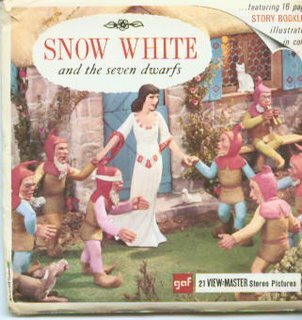 My sister, brother and I each had our own reels, I owned these. It came with a little booklet. I loved this shampoo when I was a teenager, I probably wouldn't like it now though. 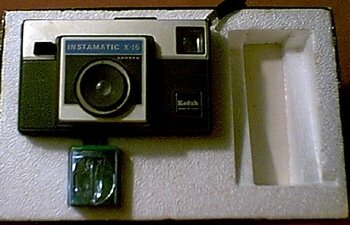 This camera took most of my childhood photos and I claimed it as my own when my parents finally got a 35mm camera (by then I was a teenager). I've come a long way since then (see photo website and blog links on the right). This was one of my favourite books, I must have read it a dozen times or more. 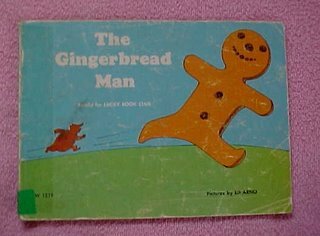 I remember bringing it to school and getting my grade 4 teacher to read it to the class. 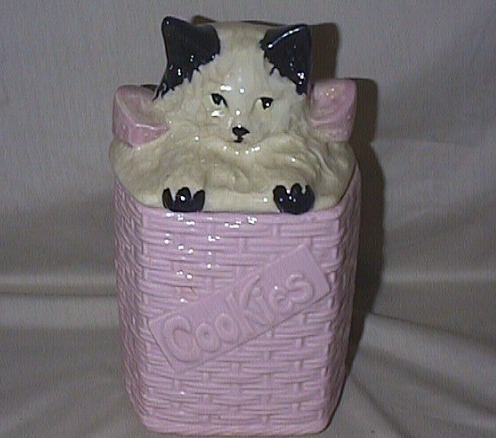 This was the only cookie jar we ever owned. I don't remember what kind of cookies were usually in it, but the back of the cat's ears made a perfect place to store chewed gum! 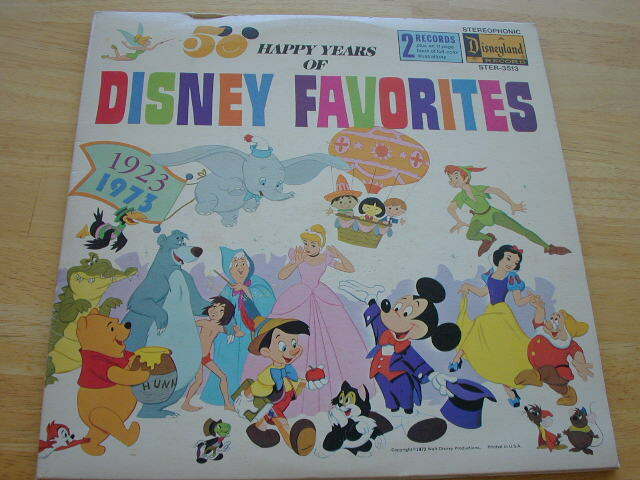 This book came with a small record so you could listen to the story and follow along in the book. I think I got it through a book order at school. 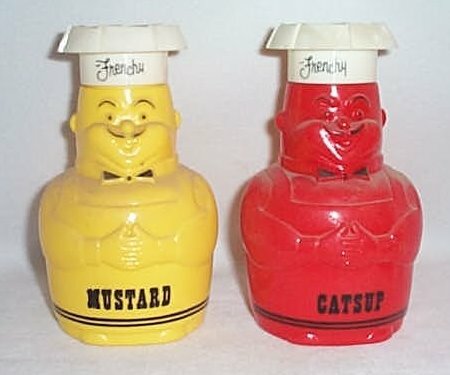 For years when I was growing up we used a kechup squeeze bottle in the shape of a little man. The cover was like a chef's hat. When we wanted ketchup we'd say "Pass the Ketchup Man" rather than just "pass the ketchup". We didn't have the Mustard Man. 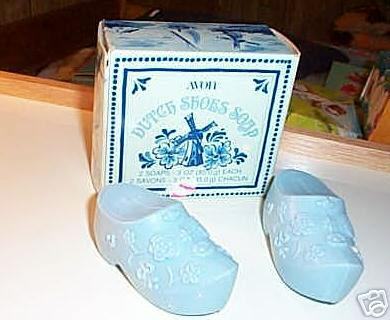 I got this soap for my birthday one year, it's from Avon. I never used it, I guess it was too pretty to use! It stayed in the box in a cabinet in the bathroom but I would take it out and look at it every now and then. I should have used it. 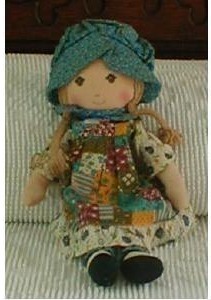 This was the last doll I owned, I got her for Christmas when I was in grade 4. My younger sister got a Raggedy Ann doll the same year. This was my older sister's but since I shared a bedroom with her it was on our dresser. I thought it was so elegant and I wanted one just like it. I guess it came from Avon. When I was in grade 2 I had a subscription to Highlights Magazine. 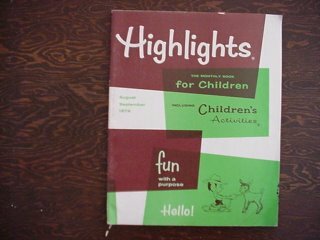 What a thrill to get mail every month, then read about "Goofus & Gallant", "The Timbertoes Family" and find the hidden pictures. 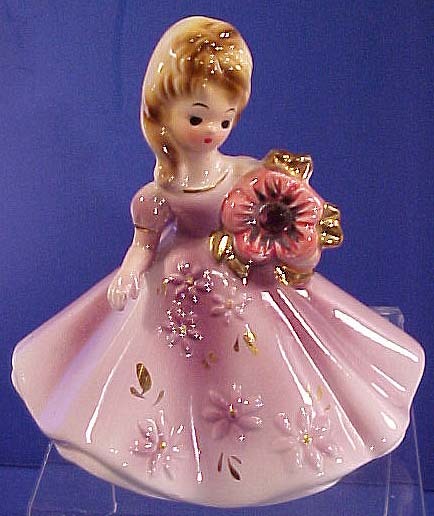 I guess I was a young teenager when my mom bought me this figurine. I kept her on my dresser in my bedroom. My 3 sisters had similar ones for their birth month as well. 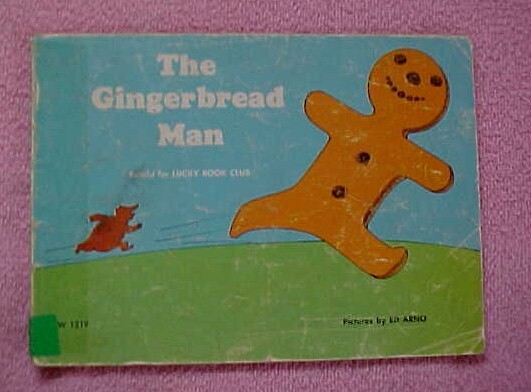 This was one of my first books, I don't remember when I got it. 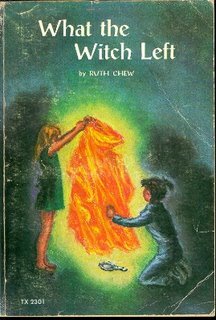 I do remember leaving it in the back window of the car and the cover faded. One year my older brother had a paper route. For Christmas he bought us all really cool gifts, this was mine. There were 2 records and the record case opened up to a booklet with stories about the songs and lots of pictures. I loved it. I got this game for Christmas one year. 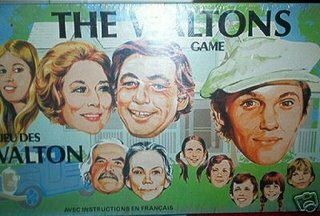 I don't remember all of the rules, something about collecting cards and having to get a set of four. I didn't enjoy the game, it was boring and didn't make much sense. I think I was disappointed because I loved the TV show.